Remember who you are. It’s a simple phrase but one with deep meaning. I have said it multiple times as my children have walked out the door—off to school, out with friends, on a date. But the phrase becomes more powerful when we add to it: “Remember who you are … and where you came from.” Remembering where you came from is a powerful tool. Helping youth remember is vital. Youth are getting sucked into a cycle of messages that tell them they are not enough when they log onto social media. As parents, grandparents, and leaders, we can tell youth to remember their past as an important way for them to overcome the hardships life throws at them. We can remind them that their ancestors also overcame hard things. I realize remembering is not a cure-all leading straight to happiness, but it’s a meaningful step in the right direction. This article offers both the whys of remembering and the hows of doing it. At RootsTech earlier this year, I was struck with what Steve Rockwood, CEO of FamilySearch International, had to say about remembering. He said remembering helps us to connect with others. And he said of youth, “They want to discover who they are and what they are.” I find this to be true when I take the time to sit down and talk with my children, even about my own life. They are instantly captivated—especially my younger children. Remembering family stories gives kids confidence. Social media can be damaging to kids; remembering their history will help them. It is powerful when generations work together. 1. Remembering family stories gives kids confidence. A few years ago at RootsTech, I had the chance to meet Bruce Feiler, New York Times bestselling author and columnist. He has written The Secrets of Happy Families and books on the power of story. He told me that children are more confident when they know where they came from. You can read my article about the study he cites. But aside from studies on the power of story, I have personally learned that some of the happiest moments with my kids are spent remembering—remembering great-grandparents, remembering how their dad and I fell in love, even remembering the days my kids were each born. Just last night I was talking with my oldest son, who is now 23, about where he was when his sister was born. I told him about how his great-aunt Randy rushed to the house to watch him. We started sharing memories of times he spent with her when he was young. She died tragically in a car accident about 12 years ago, so the memories were warm and needed. We had a few moments of choice remembering—remembering how much he was loved and adored by his great-aunt. Don’t we often feel better ourselves when we know we are loved and adored? 2. Social media can be damaging to kids; remembering their history will help them. Scientific research is showing us how social media is harming our kids, even the little ones. A survey conducted by the Royal Society for Public Health asked 14- to 24-year-olds in the United Kingdom how different social media channels had an impact on their health and well-being. The survey results found that using Snapchat, Facebook, Twitter, and Instagram all led to heightened feelings of depression, anxiety, poor body image, and loneliness. See more about the survey on the Child Mind Institute website. When my oldest became a teenager, my husband and I made a rule that our kids had to be 12 years old to get a phone and to be on social media. But now that social media is so present, we are rethinking that plan. As an adult, I love to see what my dear friends and family are doing, but I often think of how glad I am social media wasn’t around when I was growing up. The need to look as good as everyone else and the pain that comes from cyberbullying is real for everyone but especially devastating for kids. I’m not saying to take all social media away from kids. Moderation is key. But I am saying that helping them remember their family stories can be a powerful counterbalance to social media time. Family stories and activities centered around kids can be a grounding influence in a frightening online world. Consider another source, social media critic Collin Kartchner, who writes about the damaging effects of social media on youth. 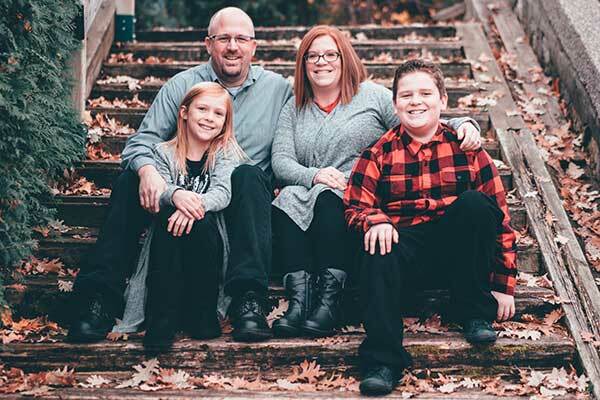 He encourages families to opt for flip phones for kids and to offer them alternatives to social media. His ideas got me thinking that remembering our families is one of those concrete alternatives. Learning about family stories together with our children builds our relationships in the present and our connections to the past. 3. Everyone deserves to be remembered. “Everyone deserves to be remembered,” Steve Rockwood said at his keynote address at RootsTech this past year. He mentioned it several times throughout his message. Every time he said this, the hair on the back of my neck stood up. Yes, everyone does deserve to be remembered. And now is the time to change the perception that it’s the older people’s job to do the remembering, that an uncle or grandma with nothing else to do will catalog all those stories. We have been trying this at home. My 7-year-old daughter, Eliza, and I often take walks together and family stories are among her favorite topics to talk about. The other day she and her dad were putting pictures on a family tree and he told her about her pioneer ancestors. “I’m related to pioneers?” she asked with a squeal. 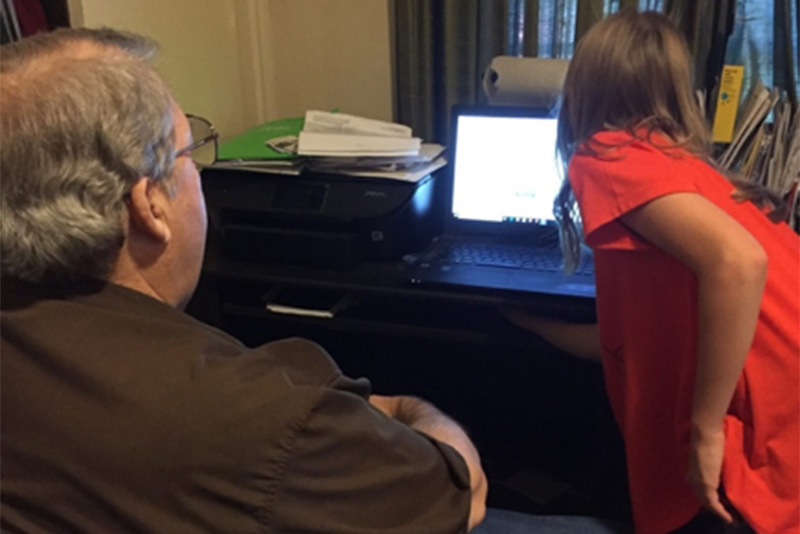 After her dad’s simple “yes,” she clapped her hands and jumped up and down. Who knew a simple discovery was better than ice cream on a late summer night? I felt emotional as she touched the photo of her great-grandmother and said, “I think me, you, and her all look alike.” Her great-grandma has been remembered—she deserves that. And we all felt connected at that moment. 4. It is powerful when generations work together. Many grandparents will often do anything for their grandchildren. I saw that come to life just last week when my 12-year-old daughter snuggled up next to her grandpa. “Grandpa, would you like to set up a FamilySearch account? I could help you.” “Sure, I would like that” came his easy reply. My daughter looked up at him. “Were you thinking we should do that now?” he said with some hesitation. “Yes!” she said as she hopped up, lending him her hand. At that, the two went to the computer. He is now officially set up on FamilySearch. Many discussions have followed. What I watched that day was magic as an eager young girl shared and remembered with her grandpa. He was a willing participant simply because she asked. The little children will lead them, right? 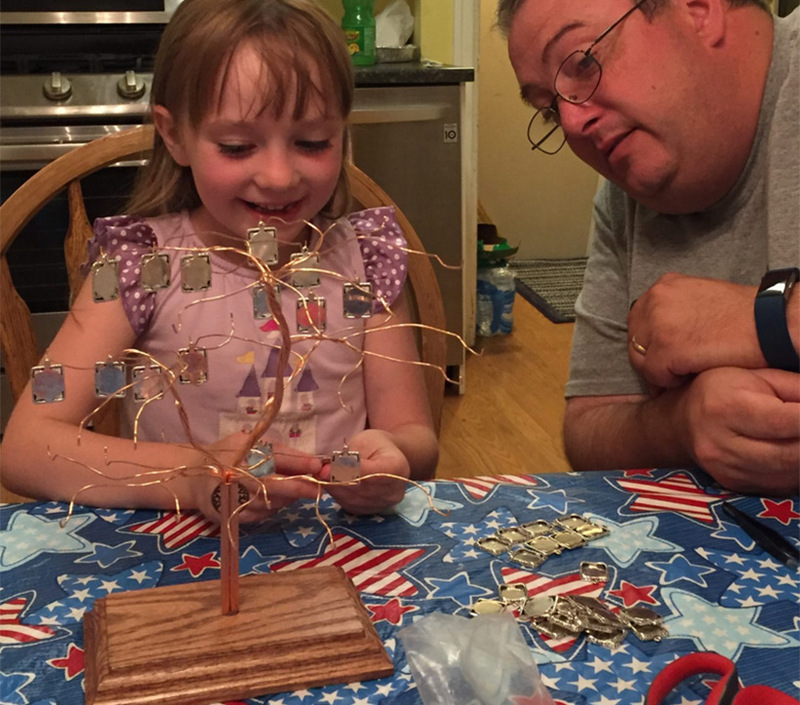 Make a family tree, literally. Introduce your kids to family history apps. Take a family vacation to a “remember” place. Interview your kids and have them interview you. 1. 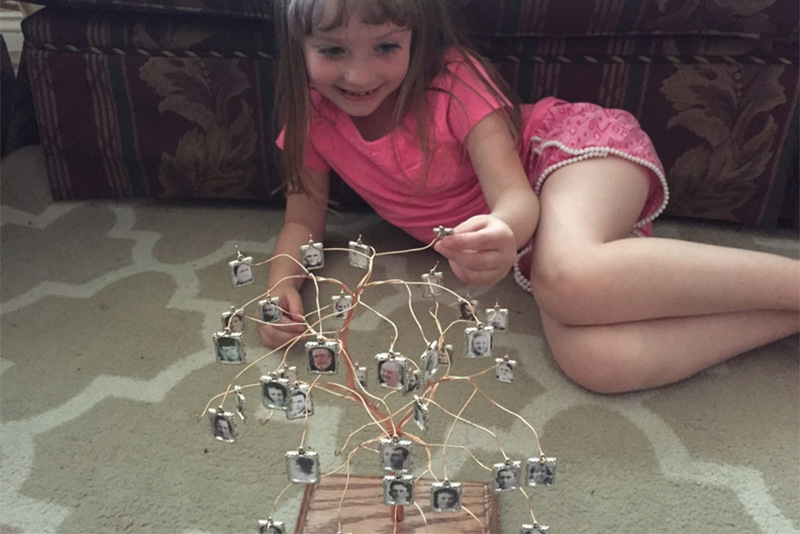 Make a family tree, literally. This exercise can be simple and fun for the whole family. There are many templates and ideas on how to make family trees. Our family found some three-dimensional family trees from thetapestree.com. We printed small photos of each member of our family. That activity has led to hours of my daughter interacting with our family tree. She gazes at it often, remembering who she is. Kids are more engaged when they can see a tangible name and date and even a photo. Here are a few links to printables I really like: FamilySearch Keepsakes, Family Tree Templates, and Growing Little Leaves: Genealogy for Children. 2. Introduce your kids to family history apps. The FamilySearch Memories app is a treasure. Here you can upload audio, photos, and journal entries. But what I like best is that the app is user-friendly and easy for children to figure out. They can interview a loved one right within the app and upload it to FamilySearch. This app provides screen time that is safe and worthwhile. Our cemetery visits with some of our children are a tradition we all love. Visiting a cemetery may sound creepy, but I promise, it’s not! 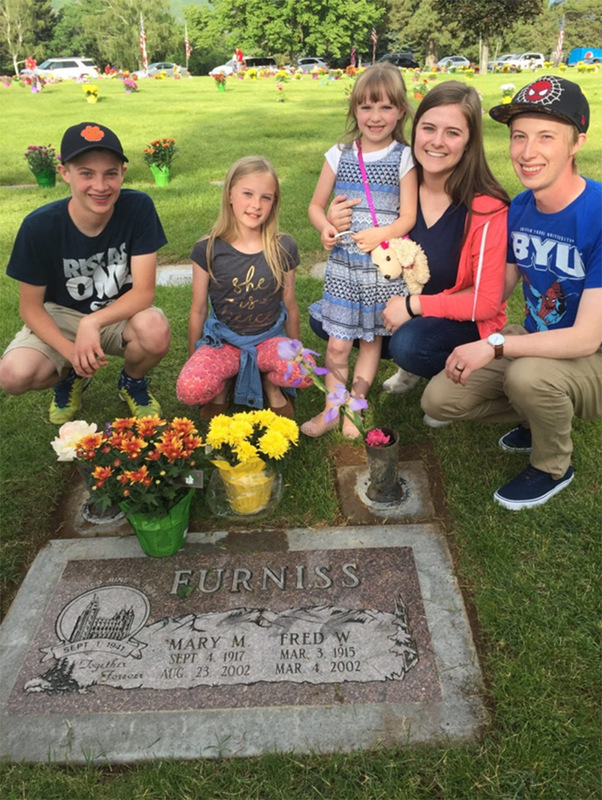 We often visit cemeteries on Memorial Day, but we have started incorporating a cemetery visit into our family vacations or day trips. If we happen to be in an area where we know a family member has been buried, we stop. We visit the grave, we talk about the person, and we encourage our kids to write about the experience. Sometimes we visit military cemeteries too. Those cemeteries help our children to understand the sacrifice for freedom many have made and to love and respect those who have gone before us, including people of different cultures who view death in different ways. 4. Take a family vacation to a “remember” place. Family vacations are the best part of life, right? A road trip is a great time to help kids remember who they are. We have had the chance in the past few years to visit specific places where we have family history. One key thing Steve Rockwood said at this last RootsTech conference that really stuck with me is to take our children to the places where our ancestors lived: “Walk where they walked, eat where they ate,” he said. These “remember” places help us to connect to them. If you can plan out an extensive vacation where family history is key, that is wonderful. If not, try to figure out a way to weave some remembering moments into your trip. For specific ways to create vacation memories, click here. 5. Make a family recipe. 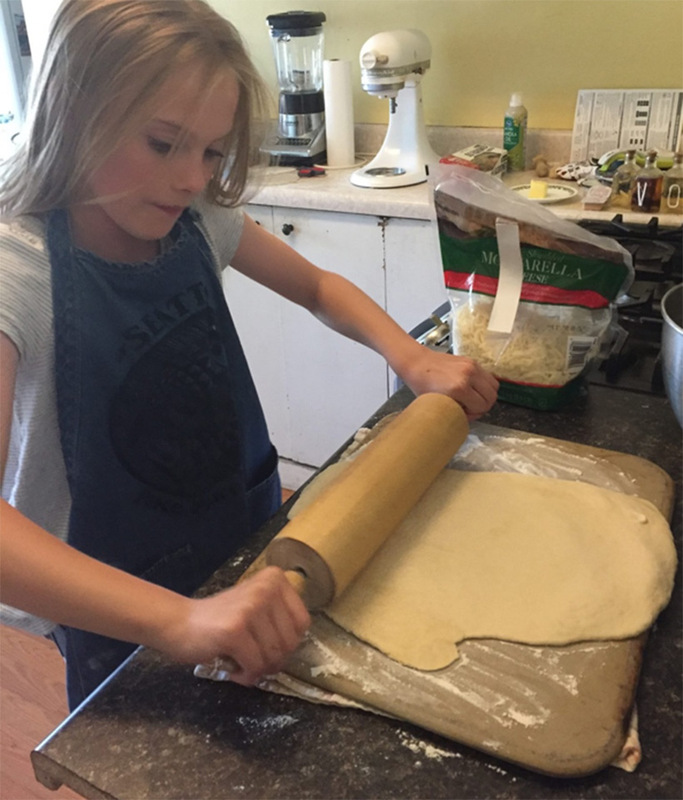 Family recipes are a perfect way to remember, like me cooking up a family recipe of tomato basil pizza with my daughter. My extended family has created cookbooks as a way to share family history, and my cookbooks are well worn. These family recipes are my favorite because they are tried and true, and as I cook them, I have great conversations with my kids. We talk about the person who submitted the recipe and why we love to eat it! The end result is full bellies and something we want to do again and again. Read how some of the best family interview questions start with food. Journaling together seems simple but does require effort. My best advice is to set aside time each week to have some quiet journaling and writing time, even if it’s drawing time for the younger ones. They can draw out family stories or you can even write for them. I have done this when my kids were younger, and remembering those memories years later is priceless. 7. Play a “remember” game. Games like Pando or the Ungame are great conversations starters and great ways for us to remember those have passed away or our recent family memories. Both of these games are card games with no winner or loser, but because our family likes to compete, we often add an element of competition. Our kids beg to play these games weekly. You can also make up some remembering games. A picture match game with old family photos or a Jeopardy game can be fun with only small effort. Related: "Is Family Storytelling and Family History for Kids? Yes!" Instead of letting the screens do all the work, put your kids to work on the screens. Apps like iMovie, Adobe Spark, and Animoto are great tools for kids to make family history videos. The videos don’t need to look professional, so the kids can let their creative juices flow. Learn more about these programs here. If you can give your kids access to old family photos or even videos, these programs can easily guide them to make these memories come alive. If you don’t have old photos or videos, let the kids do something with grandparents, parents, or even themselves. No matter what they do, if the project includes them or someone they love, it will mean something later. 9. Interview your kids and have them interview you. Ever tried interviewing your kids? 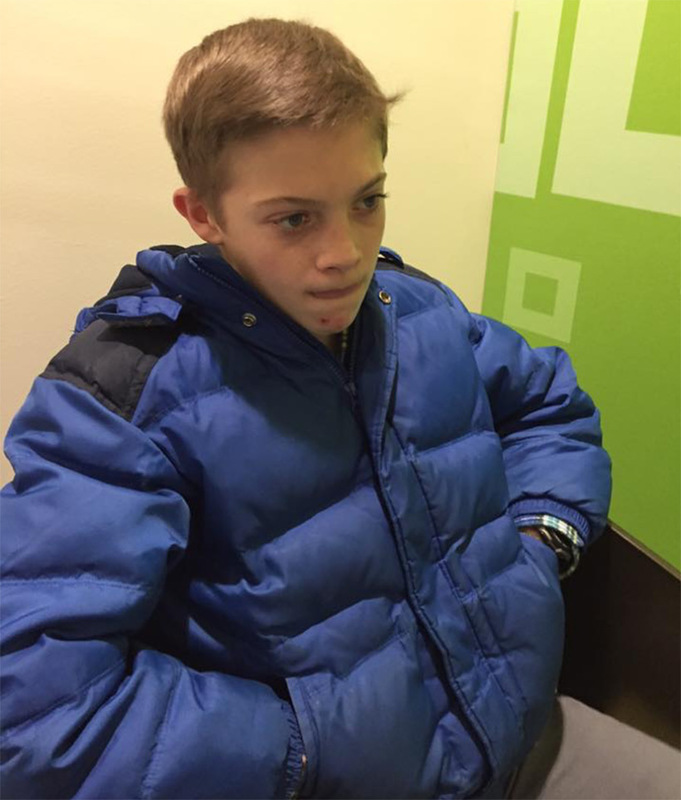 One of my most poignant moments as a mom was when I stepped in on an interview my 14-year-old son was doing at the FamilySearch Center in Salt Lake City. He was being interviewed by someone on a television screen, but I was enlightened when he talked about his favorite vacations and when he described each family member in one word. I gained insight into who he was and some of his inner thoughts. 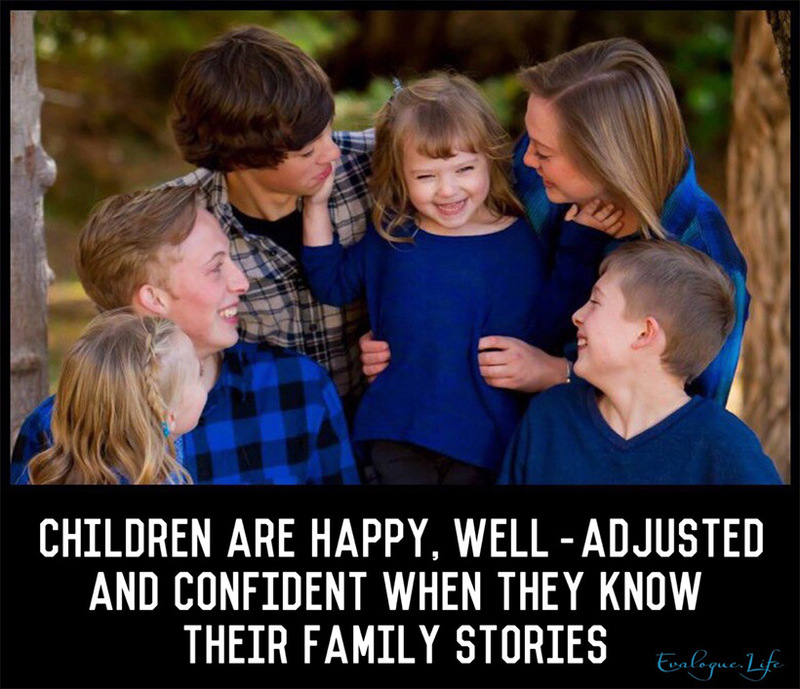 Pull out your phone or recording device (we have some favorite recording devices) and conduct a little interview to get to know your children. The interviews will also help them become more self-aware. There may be no better way to help young people remember who they are than to have them articulate their own answers, especially if they are recorded. Then, let them ask questions of you or of a grandparent. Not only are these sweet and tender moments but they will be cherished forever! Listening to someone’s voice after they are gone or listening to a child’s voice once they are grown is priceless. Do it now, and it will be enough. As a mom, I’m not perfect at all this. I try. I try to help my children remember who they are on a daily basis. I fail some days; some days they do just sit in front of the television or look at social media a little too much. But there are some days that are different. We remember, and we make memories. Rachel J. Trotter is a senior writer and editor at Evalogue.Life—Tell Your Story. She tells people’s stories and shares hers to encourage others. She loves family storytelling. A graduate of Weber State University, she has had articles featured on LDSLiving.com and mormon.org. She and her husband, Mat, have six children and live on the East Bench in Ogden, Utah.